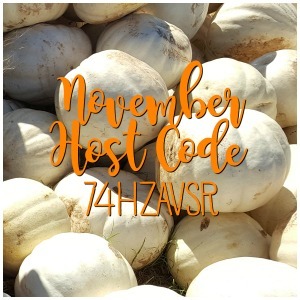 This month our theme for the hop is Sorry/Sympathy/Get Well. I have a hard time making sympathy cards when I need them, so it’s good to keep them on hand. I prefer to make sympathy cards that have at least some bright colors in them, because I want a sympathy card to lift the person’s spirits. 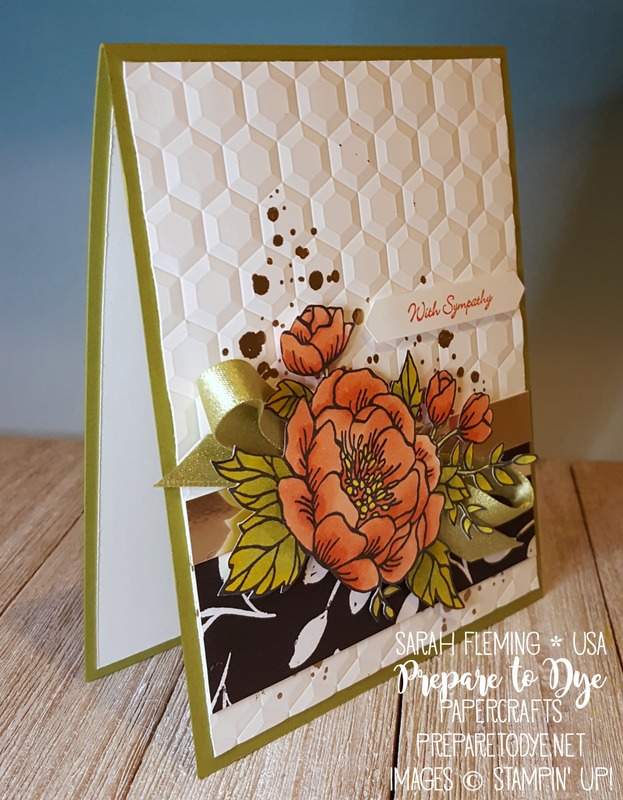 My card base is Old Olive, and on top of that is a Whisper White mat embossed with the Hexagons embossing folder. I added some splatters from Swirly Bird on the mat in Versamark ink, then heat embossed the splatters in gold. I added the strip of Merry Little Christmas designer series paper — I love how you can use this paper for things other than Christmas projects. Then I added a half inch strip of a Champagne Foil Sheet. 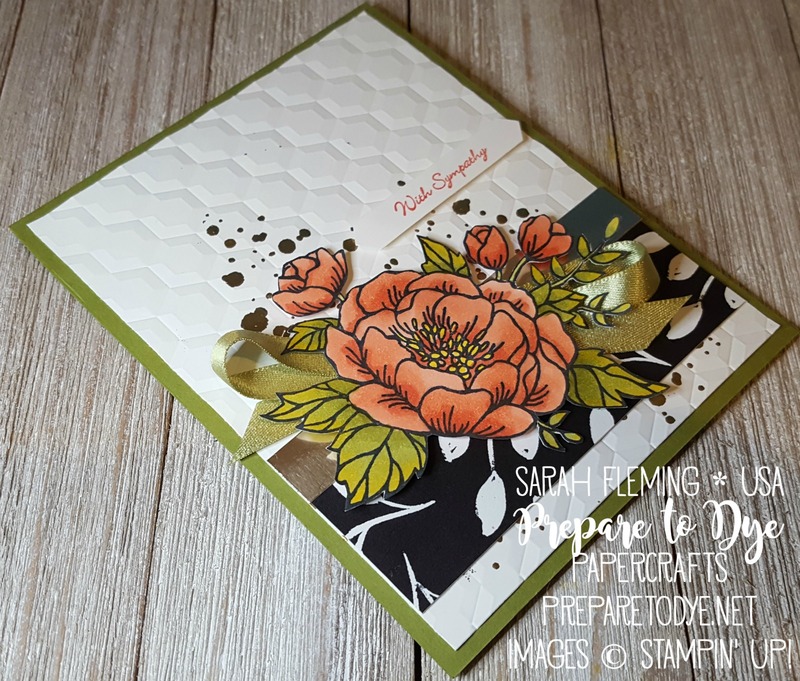 For my focal point, I started by stamping the large flower from Birthday Blooms in Memento Tuxedo Black ink, then coloring it in with the Stampin’ Blends. For the flower petals, I used Dark and Light Calypso Coral. For the leaves, I used Dark and Light Old Olive, then added Dark Daffodil Delight to the tips of the leaves. The bits at the center of the flower are colored in with Dark Daffodil Delight. I fussy-cut the flower out. Before I added it to the card, I made some loops with the Pear Pizzazz 3/8″ Shimmer Ribbon (delicious) and stuck it to the card with Tear & Tape. Then I added the flower on top of the ribbon with Dimensionals and Mini Dimensionals. The sentiment is from Teeny Tiny Wishes, punched out with the Classic Label punch. I hope you enjoyed my card today! Make sure you follow the hop all the way back to me so you can see everyone else’s projects. 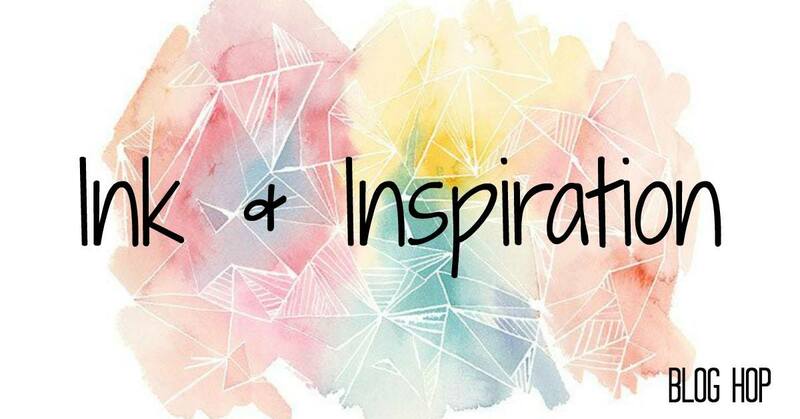 The designers on this team are so talented — you won’t want to miss any of the blogs! What a lovely card, your colouring is awesome! 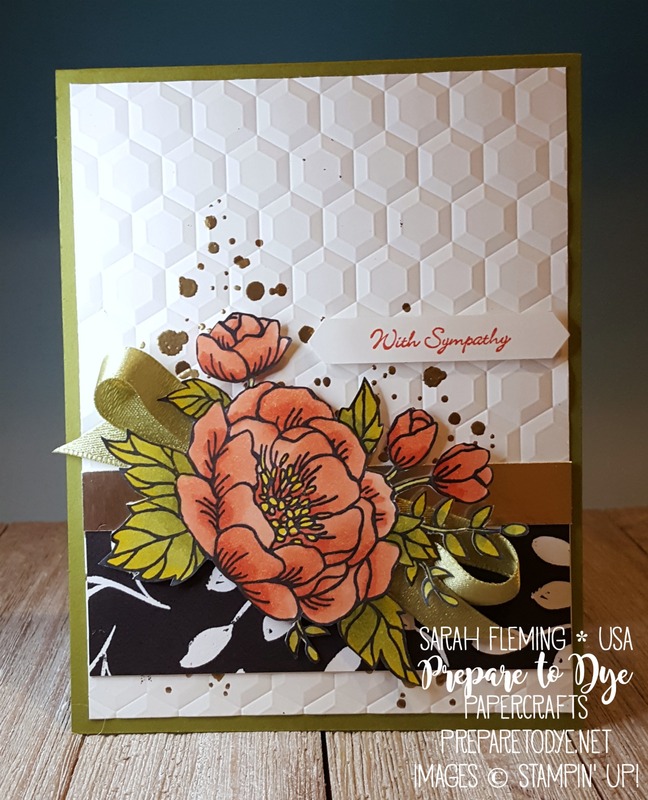 stunning card Sarah! I love this rose fussy cut out and it looks wonderful with your back ground!